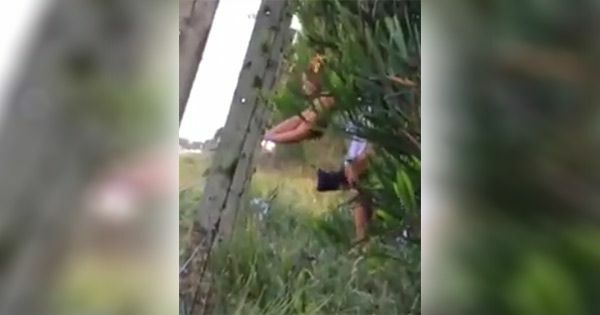 Before realizing that the video was scandalous, unsuspecting viewers believed that the woman was electrocuted while touching a cyclone fence. Netizens got curious when Facebook user Kurdapyo posted a clip titled "nakuryente" (facebook.com/KurdapyoBryl/videos/276033682793617) and warned everyone to be aware when in secluded areas. The 44-second video shows a woman shaking like she was hit with electric current carrying thousands of volts. It turned out that a man was with her and they were doing a lewd act while hiding behind the bushes, away from public eye. As of 11:45 a.m. today, the scandal video got viral with more than 28,000 shares and over 2.4 million views on the social networking site. It has also generated 13,000 plus comments. It's unknown whether or not it circulated in other parts of the worldwide web. In spite of being sexually suggestive, Facebook has not removed it probably because the private scene is "not too obvious."